Sometimes the simplest dinners are the best ones. In taste and in ease. The only ones better than that? The dinners that seem like they are complicated but are in fact a breeze. The ones in which your husband/roommate/friend/mother thinks that you slaved over a complicated dish and in which you merely toss your hair over your shoulder and claim how it was oh, nothing! A dinner that's delicious, simple and will get bonus points for seemingly a lot of work? Um, why would I ever cook anything other than this dish? To prepare for our 5K on Sunday morning, not to mention the terrential downpours curbing our desire to leave our apartment, Shaun and I decided to have a nice dinner at home. Possibly in front of the television. 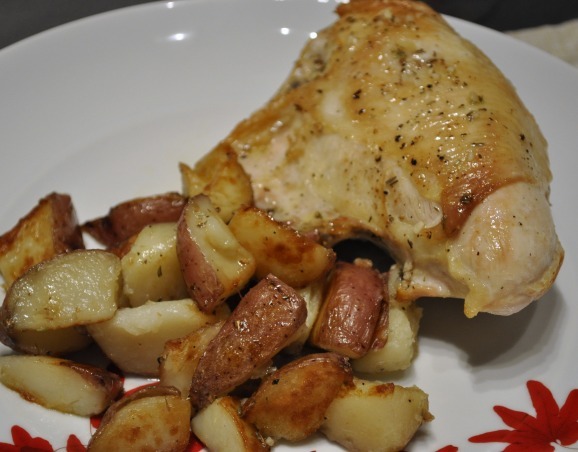 I had been wanting to test out some more recipes from my giant America's Test Kitchen Cookbook (you may see another fab recipe here) and when I came across a recipe for roasted chicken and potatoes - which claimed to only take 30 minutes, no less - I just had to give it a try. Roasted chicken? Good. Potato wedges? Good. 30 minute timeline? Goooood. This dinner came together in a snap and had Shaun already planning how soon I could make it again. It combines simple ingredients and cooking methods, but packs a ton of flavor and texture. A perfect any-night kind of meal. With a rack at the lowest possibly position in your oven, preheat it to 450 degrees. Remove the chicken from its packaging, pat dry with a paper towel and sprinkle with salt and pepper. In a non-stick skillet, heat 1 tbsp of the oil. Once it is extremely hot (sprinkle just a drop or 2 of water in the oil - if it sizzles, it's ready! ), place the chicken skin side down in the pan. Cook about 5 minutes over medium heat until the skin is golden brown. Meanwhile, get the potatoes ready. Place the wedges in a microwave-safe bowl. Drizzle with 1 tbsp olive oil, sprinkle with salt and pepper and toss to coat. Cover the dish with plastic wrap and microwave for 5 minutes, stopping midway through to shake the bowl around. Transfer the chicken to a baking dish with the meat thermometer inserted into the thickest part of the meat. Roast in the oven for about 15-20 minutes, or until the thermometer reads 160-165. Once the potatoes are tender, transfer to the now-empty skillet (do not clean the skillet out first! ), and sautee about 10 minutes until the wedges start to brown and crisp. In a small mixing bowl, whisk 3 tbsp olive oil, lemon juice, garlic, thyme, salt and pepper together. 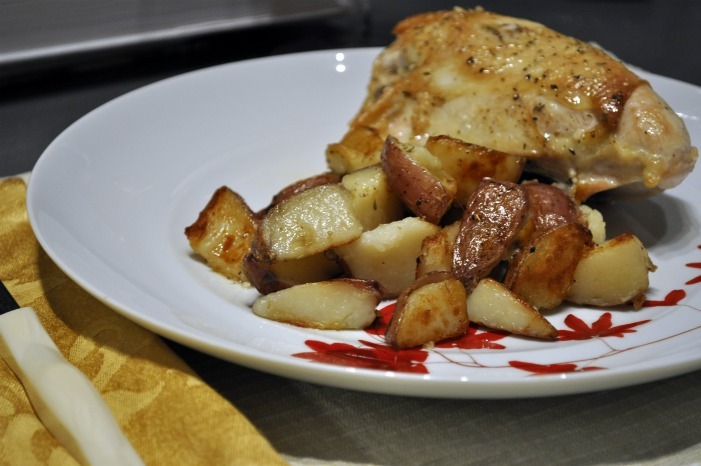 Serve over the chicken and potatoes. *Yes, I highly recommend using this kind of chicken, not a skinless boneless breast. Even if you plan to discard the skin, it will keep the chicken juicy and moist through the roasting process. Otherwise it will end up dry and unflavorful. No one wants that. **I purchased a no-frills probe thermometer at Bed Bath & Beyond for about $4. Do it. It's worth every penny and will save you (and your meat) from being hacked into so that you can see if the chicken is cooked through. The thermometer doesn't lie. If it says 160+ degrees, your chicken is done. So there you have it. My super duper easy peasy new favorite dinner. And one that I will be making again soon. Oh and next time I'll be sure to include something green on our plates too. Some roasted asparagus or Brussels sprouts, perhaps? And I'm pretty sure this would work just as well with sweet potatoes instead of white, if you prefer. So what do you think? Have you made any simple dinners that look like you slaved away over it?